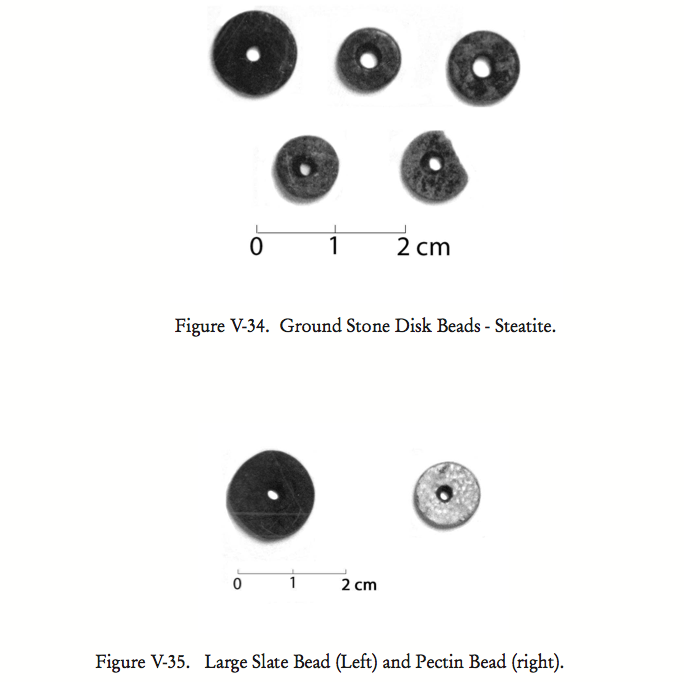 Examples of typical NW Coast archaeological beads, from B. Thom, reference below. Firstly, each bead represents a significant investment of labour. Even if we conservatively say that you can make a small stone or shell bead in 5 minutes, then at 12 beads per hour, the individual was buried with some 29,000 person hours of labour investment. That’s about 194 person-months of work, or just over 16 years of full time employment for one person. (Incidentally, the five minutes is less than half the time UVIC’s own Brian Thom estimates from a brief experiment in Chapter V, here.) However we may conceptualize the concepts of “work” and “effort” and their relationship to wealth or prestige in the past, we can’t just write off the full time labour of one person for 16 years, or 16 people for one year. That’s a huge investment of time which could otherwise be used for fishing, hunting, gathering, or creating useful or durable technologies such as houses, canoes, or what have you. Such measures of labour investment are commonly, if sometimes simplistically, used to gauge the importance of the deceased individual in both life and death. Apparently, in addition to this individual, there are other burials, including a young woman buried in a similar manner, from the site (DjRw-14). Secondly, the burial is very old in relation to its elaboration.. While I haven’t read anything other than the news article, I’ve heard through the grapevine that the dates of around 4,000 years ago are solid. This is very challenging for some constructions of NW Coast culture history which see something of a slow march of progress towards Marpole at least, if not to the present. Taken with the amazing, but largely unpublished, finds of Wapato intensification from Pitt Polder, and some other early (also 4,000-ish) elaborately “em-beaded” burials, notably from Tsawwassen and Cowichan Bay, and the “Charles Phase”, long seen as a generic time interval in which people “waited to become complex”, is taking on a new character, no? A third related thought is that it is striking how the investigators, Terence Clark from the National Museum of Civilization and Gary Coupland from University of Toronto, are able to conduct archaeological investigation of human remains in an ancient cemetery. It speaks very well to their community relations I suspect (see the article) but also highlights the mosaic of indigenous perceptions and reactions to the practice of archaeology within the Salish Sea, many locations in which such a project of deliberate targeting of human burials would be currently unthinkable. Finally, the article suggests an ambiguous degree of protection for the site, with something called a “map reserve” providing 10 years of protection from development. I am not at all sure what this is about. I would have thought that the site itself, protected under the Heritage Conservation Act, presumably with the highest ranking of cultural and scientific significance, would be immune from alteration for that reason alone. Thoughts? Clarification? Anyway, these results are very interesting, and pose a welcome challenge to received notions of the trajectories of “cultural complexity” in the Strait of Georgia. I look forward to seeing more from this exciting project. This entry was posted in Archaeology, First Nations, Northwest Coast, Shell Middens, Uncategorized and tagged beads, cultural complexity, human remains, mortuary archaeology, Sechelt, shíshálh, Sunshine Coast, Technology. Bookmark the permalink. Great to see a blog entry!! I’ve missed the unusual, interesting things that Quentin has brought to light that I might otherwise never have come across, and the lively debates. This is a fascinating story, on all the levels Q discusses. I have long suspected that something quite remarkable developed in the Charles period. The Tsawassen burial of a youth, with its ca 64,000 stone and shell beads, was a game changer when it was found in 1989 or so by the Arcas consulting firm. Several other burials with extraordinary numbers of beads were also found during this excavation, but these finds, and the logical derivatives of these vast numbers of beads, seemed often ignored in academic discourse till recently. I remember a time when any burial found with stone beads was automatically assigned to the Marpole culture type (so for these there was no real need to run radiocarbon dates). One of the diagnostic traits of the Marpole period was the frequent presence of stone beads with burials of its people. This was a classic case of circular reasoning that lead to very wrong conclusions. These Shishalh remains solidify the presence of extraordinary wealth with some burials 4,000 years ago over a large area of the Salish Sea. A third of a million stone beads??? That is simply astounding!!!! Nice to see a qmackie blog. Especially one about such a cool discovery. I too find it interesting to see this kind of interest in excavating human remains in the Salish Sea – I know of a (very) few other First Nations with similar interests who are pursuing DNA studies of their history through human remains and similar research involving human remains. I have heard before the rumour about a 10 year limit on Land Act reserves, but looking at the legislation there is no evidence that they have an expiry date – they are signed into being by the Lt.Gov through and Order in Council, which means they have gone through Cabinet for approval. To remove them requires the same process. Land Act reserves *do* allow for construction of roads within their boundaries, and the relevant Minister can issue temporary authorisations to occupy land within a reserve for up to 2 years. However, when such approvals are being considered, and there is a reserve in place, then there is a much higher duty to consult and to consider alternatives and thus a significant purpose of a reserve is to raise all kinds of cautionary flags early in planning processes which normally means plans are moved to another location. This all assumes there is a Land Act Reserve in place – I have come to learn that archaeology stories in newspapers almost never are accurate, almost always are biased to one view point, and are never complete. So, maybe there is some designation on this land through the Forest Act, or other legislation, or maybe there is none at all. In any case, the site is automatically protected by more than one section of the Heritage Conservation Act, and would be considered of very high significance (if there is any of it left after all these years of excavation). It would be a very big challenge for anyone to find a way to develop within the site boundaries in an acceptable manner, or to temporarily occupy it for pretty much any purpose. There would need to be a great deal of consultation and concurrence from the First Nations since it is currently Crown Land and does not have a history of prior development and fee simple occupation. I think there is a useful purpose in layers of protection – it means different arms of government are more likely to notice that there is a protected status, and it also means that if someone is messing around down there then more statutes can be brought to bear in enforcement cases, and that such situations are more likely to end up before the courts. Examples of this are found among the few convictions under the HCA – one of which involved charges also under the Forest Act (and for which Morley was a witness) and another which involved a restrictive covenant (which removed the grey areas of a defense of \”how could I know about this?\”) and thus resulted in both civil and criminal charges. Morley — the Tsawassen finds *should* have been a game-changer, but I can think of at least two textbooks subsequent to 1989 which don’t really weigh the implications of those finds adequately, in my opinion. The narrative of Simple To Complex has historically been too powerful to resist, partly because it then situates NW First Nations in their “rightful place” in Anthropology — breakers of the rules about hunter-gatherers, who thus require an alibi for defying the Anthro wisdom!! APM – interesting background. Yes, redundancy in protection must be a good thing, nice as it would be to think we don’t need that. Is there actually a chance that there might not be anything left of the site after archaeological research? I don’t know about how much there would be left – I think there have been several years of excavation, but have no idea of how much they have done, nor how big the site is. Just making the point that there are lots of variables at play in questions of protection, one of which is whether the site is sufficiently intact to still be considered significant. I am a PhD candidate under Gary Coupland at the University of Toronto, and part of the Sechelt Archaeology Project. Along with Bryn Letham (now a PhD student at UBC), I excavated the 350,000 bead burial and co-excavated the second burial. Here is a brief background on how these burials came to be excavated. Gary Coupland began working in shishalh territory just as I began my PhD and another student, Lisa Johanessen, began her Masters project with him. With Gary’s generous donation of undergraduates (8 of them!) and my wife, I excavated the very interesting site of DiRw-28 at Trail Bay, while he conducted excavations at DjRw-1 at Porpoise Bay. Lisa and Bryn Letham, who would begin his Master’s that fall, conducted a survey of Salmon Inlet. This was the summer of 2009. In the time between then and the following summer, the research that would I need to do for my thesis – basically looking at subsistence practices over the last 5000 years in shishalh territory – became clearer. I figured that I would need to look at more sites and so for the summer of 2010, I planned to do test excavations in Pender Harbour and in Salmon Inlet. For the latter area, I asked Bryn if they’d found any sites that had relatively deep shell midden components and seemed like they might have been some sort of settlement site. He suggested working at DjRw-14 because it had these characteristics but also because they had found something rather amazing at the site. DjRw-14 is overlain by an abandoned bible camp. Most of us refer to the site as “bible camp”. This camp was actually called “Glad Tidings” and it ran from around the 1950s until around the early 1980s, after which it had delapidated The topography of the site was significantly altered by the building and use of the bible camp, including the place of interest. The land had been leased from the Crown and the lease expired in 2010. It turns out that this bible camp had been built on top of (and into) an ancient “Indian” burial ground and then abandoned (as in some horror film that probably exists (Friday the 13th?)). The place of special interest at DjRw-14 had had some of its pre-bible camp deposits removed and had been leveled. When Bryn and Lisa surveyed this site, they found a layer of stone beads in the exposed deposits. Thousands of these beads had already eroded out of the bank and were spilling onto the ground. When Bryn brought this up, I was interested. He also told me that the site got a lot of visitors – kayakers out of Porpoise Bay and Tuwanek, boaters, and ATVs and, previously, 4x4s (the “road” in is very rough these days, so I’ve been told by the ATVers for whom we would quickly cover the bead-burial unit and direct them to the shell midden units, in which they lost interest immediately. Obviously the roads were better in the past – we found a school bus up the “road” not too far from the camp). At best, visitors know that archaeologists don’t do dinosaurs but at worst they have some rather distorted views about First Nations peoples and how to respect the past. The scenario of some looky-loo finding a bunch of stone beads eroding out of a bank and then digging, probably with their hands or something entirely imprecise (a stick? ), the beads and what was beneath them (i.e. probably the remains of a person) seemed real enough to us. We discussed this very scenario with the Sechelt Indian Band council before getting Provincial permission. In the summer of 2010, Bryn and I as well as my wife – a CRM veteran with a background in archaeo-osteology – and a student volunteer, excavated at DjRw-14 and uncovered an adult male buried with 350,000 beads which had obviously been strung and likely woven into a blanket or a robe and wrapped around him, dating to c4000 BP. Most of these bead were ground stone, some were shell. We also excavated in the shell midden (which dates to c3000 BP) located metres away. The following summer we were joined by Terence Clark, from the Canadian Museum of Civilization, and a larger crew and returned to the site to establish the archaeological context of the burial and, in doing so, found another burial. This time, an adult female with around 20,000 stone and shell beads – mostly from necklaces – and four purposefully broken chipped stemmed projectile points at her feet. Gary and Terry initiated a community archaeological project this summer and conducted further excavations at DjRw-14 this summer, which are described in the Coast Reporter newspaper article. We did initially attempt to get our student volunteers to count the beads (made it to about 20,000!) but opted for sub-sampling after the size of the task became apparent. Even though people have said (myself included): “nothing like that has been found before!”, as Quentin and others have noted they aren’t exactly unprecedented – two of the Tsawwassen burials have the same type of beads, tens of thousands of them, and almost exactly the same radiocarbon dates. The work at DjRw-14 (as this discussion shows) will allow the Tsawwassen site to (re-)emerge from the mist and I think this will affect the classic ideas of cultural “development” in the Gulf of Georgia (i.e. we might have better evidence for systems of social inequality in the Charles period than in the Marpole phase). Unfortunately, I have no idea how well this site can or will be protected, but I hope that some expediency can be practiced by the government if only in the interests of ensuring that such a meaningful and beautiful place is somehow preserved. Quentin, Al (Mackie Bros), Morley and David: Amazing site, work and discussions. Quentin: welcome back from your outstanding field work in Haida Gwaii with Daryl Fedje—sure enjoyed the opportunity of working with Al as a volunteer for 2 weeks on this great work—hope your family is doing well and you are back in the UV saddle. My shoulder is re-attached, so maybe I can do more than screening in future…. I believe we have complexity at some level and Q is correct on how this shakes up the typical effort to fit NWC into anthropological paradigms. With the hours of labour (Labor Day in the States today….) pointed out, we may also have to suggest early stratification with the possible use of slaves (may seem like a long-shoot in most researchers minds) to make this kind of wealth. One person taking 16 years for the one robe is mind-boggling—and may at least require some specialization. Reminds me of John Jewitt making jewelry for his owner Maquinna (since he could not fish…). As a wet site take, I personally was impressed and pointed out the fact that hats, often an indicator of who you represent in a culture (like Q’s hat at Kilgii Gwaay), included distinct woven knob-top forms and round-top at the 3000 year old Hoko River site. Also a possible woven knob from a hat was reported at the 3000 year old Musqueam NE site. I suggested these were some kind of early marker of status for the wearers as they are with Coastal communities now, possibly reflecting early stratification. Since wet site perishables are only recently becoming part of the main stream discussions in NWC work, this kind of find did not always stick with others in the literature. In Quentin’s Comment section on “Hoko River Pictures are Back…” you can see some of these hats under “Wet/Dry Site Artifacts” menu when you click on “Hats.” Also we found amazing beads made of coal and graphite (under same area, but “Lithics” and click on MUP00191)—but only 4. Another side-ways sign of complexity, or at least 3000 year old signs of NWC art trends, is the carved and painted wooden mat creaser depicting male-female kingfishers (click “Mat Creaser”) and also the wooden “Comb.” Since this is a Locarno Beach phase site (by lithics), certainly it stretches “Marpole” complexity back, though not as far as these burials. Even in the basketry quality, gauge of weave, seems like you see progressively finer work at NWC wet sites as you go back from 1000 to 2000 to 3000 years ago—possibly reflecting more time available for even utilitarian efforts (reported in 1995 Hoko report, WSU Press). I really appreciate David Bilton giving such a detailed history on this amazing work—love the Tribal/public interactions parts too. Thanks for all the coverage on this spectacular NWC work. Keep up the great work! great that this post can highlight the interesting backstory and appropriate credit to Bryn and David, David thanks so much for sharing! Thanks for everyone’s interest in our project! Q was quite right in pointing out two of the most amazing parts of the shíshálh Archaeological Research Project. The first is that this project is a true collaboration with the shíshálh Nation. Not every group would be interested digging up and analyzing burials. But this is so much more than just a burial project. We have numerous research projects that we developed with the community. We decide each year which will be pursued based on the interests and priorities of the Nation. This year we added an Aboriginal training program for shíshálh youth and a community Archaeology Day. We are extremely lucky to work in such a supportive and engaged community! The second, is the amazing site of DjRw-14. Tsawwassen should have been a game changer and with our work at “The Burial Ground” site, Charles will need a major re-think. We have so much more material than what David has mentionned. Since we are working on a number of publications I won’t ruin the surprise, but as a teaser…. We have unearthed a subterranean cairn feature, a double burial, a infant burial, as well as a small dwelling. All of these likely dating to late-Charles. Of particular interest are tiny shell beads (I will email Q a pic to post). They are made out of clam shell and some of them are barely a millimetre or two in size. The hole is not much larger than a strand of hair. We have found 10s of thousands with each of the four adult burials recovered. If anyone can tell me how these were made, or how much time they might have taken to make I would be very interested. I would to join the chorus of admirers welcoming Quentin back to the world of postings. In regards to the impressively early dates being quoted for the DjRw-14 and Tsawwassen (DgRs-2) sites, there is something we must consider for the latter site at least. In Volume 4 of the Tsawwassen report, I freely confess to being an enthusiast for the early development of cultural complexity in the Charles Culture, principally based on dates for burials D-14 (3880+/-80 BP; ca. 53k beads) and D-16 (3800+/-BP; ca. 11k beads). But those are standard dates for individuals whose diet was 80% to 89% marine protein (based on Brian Chisholm’s analysis), and they should be corrected for the marine reservoir effect arising from that diet. David Bilton will know if they are citing corrected 14C dates for DjR-14, but we probably have to acknowledge that the DgRs-2 bead-burials may be attributable to Locarno Beach, not Charles. Note that this issue could also affect comparably “early” claims for complex burials found at the Craig Bay and Pender Canal sites. Thanks (I think) to R.G Matson for pointing this out to me last year. Yes we did correct for marine reservoir effect based on our nitrogen values. Our uncalibrated dates were over 4000 BP and calibrated to around 3800 BP. These are in line with other bead-rich burials at Tsawwassen and Green Point. Interestingly, the two dated burials from DjRw-14 and the two from Tsawwassen have the same uncalibrated dates but only one of the burials from DjRw-14 has comparable marine protein (c90% based on Chisholm’s work) while the other burial has about 70%. Thus, when correcting using the C13/12 values, this burial – the 350,000 bead burial – turns out to have a 2-sigma range (centered around 3700 cal BP) which only just overlaps with the other three burials’ 2-sigma corrections (centered around 3500 cal BP). Obviously, marine reservoir correcting is not an exact science, especially for remains this old. Either the 350,000 bead burial is oldest or the correction actually distorts the relative ages of the burials. A deer-bone date from ostensibly the same layer as the burials came out as c3800 BP. I suppose it is possible that the burials could be from the early Locarno Beach phase, but the threshold between Charles and Locarno is a bit of an abstraction, and, moreover, all available data still points to the Charles phase. Q, recall our earlier back and forth on bead production (maybe under the ‘elfshot’ thread. I have been pondering bead production on the NWC for a while and spend a good amount of time analyzing and perusing collections from all over the place and have yet to see one microdrill. Unless the drills were organic, there should be thousands of them out there. The fact that no one has found a single one suggests to me that there may be extreme localization in bead production in a place no one has looked yet. David – thanks so much for your detailed account of how the site came to archaeological notice and of your central role in the discovery. I know Bryn slightly, and had heard from (I think) one of his volunteers quite some time ago about the buckets of beads. It’s good to know more about the chain of events. Terry – thanks for the comments and for the picture. Look for a separate post soon. Richard, Terry and David — thanks for the data on the dates. It’s a good point that marine reservoir needs to be applied to marine-diet humans as much as it would to say, a seal. I am not sure if it is as simple as saying, well, -12 means correct for 100% of marine reservoir and -22 means correct for no marine reservoir therefore -15 means correct for 2/3 of the marine reservoir. People do that, but is it right? I know Iain and Morley have a draft paper on this coming out somewhere. The difference is going to be a few hundred years. Now, the end of Charles Phase is not exactly nailed down either. So we shouldn’t get hung up working towards received categories, whether they be Locarno or Charles. Maybe a new cultural historical unit will emerge from the poorly-dated and poorly-know period 4000 to 3000, or something. With that in mind, I see a comment in a previous post that there were also hundreds of thousands of beads from the Golden Ears/Pitt Polder site (I saw a few dozen of these myself but have no idea if that number is accurate or not). Further, there is a small, well-dated set (“village”) of rectangular house depressions dating to 3000-3500 14cBP in Gulf Islands National Park Reserve. And Terry notes some further intriguing data classes from DjRw-14 (I dunno, I really don’t want to be referring to this site as “Bible Camp” for the next 20 years). Jesse — look for a new post on the drill question coming up here very soon. I was thinking discussion of Charles Phase and this site could continue here and discussion of drill ins and outs could be at the new post, but it’s not like that’s a rule or anything so everyone jump in. I plead guilty to not fully appreciating Tsawwassen when Maschner and I did our book, it’s clear that the evolutionary trajectories are full of zigs and zags and may be more like bushes than linear lines. There’s a lot of very interesting stuff happening in the Greater Salish Sea area ca. 4500-3500 calBP, of which these beads are the most dramatic. I’ve wondered for a long time where are the processing sites relating to dentalium processing. There are early historic era dresses from the Plateau completely covered with dentalia which presumably were harvested on the West Coast of Vancouver Island or some place, processed and shipped. The coast must have been exported dentalia by the ton. These beads deepen and sharpen the mystery. I think Dale suggested slave labor – that’s a possibility except I would imagine making beads this small might require a fair amount of skill, so we could also be thinking specialists. Maybe if the manufacturing is dispersed across many households (each with their embedded bead specialist) then the material evidence would be thinnly scattered. On the other hand, there would have to be a system for aggregating the beads – I see canoes with big boxes filled with beads crossing the Salish Sea. I think I should probably review the sections in Leland Donald’s slavery book in which all manner of indenture are considered in global perspective. My thinking is, can some examples of servitude include skilled labour. For example, flailing widely, the Roman mode of slavery included highly skilled and educated slaves. Finessing my ethnographic analogies is something I always struggle with. “Slavery” is such a blunt instrument to think with. Regarding your book — well, at the time the Tsawassen evidence was sort of just floating there and not much else from Charles to really talk about, or it hadn’t yet been aggregated. But Charles Phase has long not got any respect, so to speak — classic example is how it fell between the cracks and is not discussed except most cursorily in the Handbook Volume 7. But regardless — craft specialization – historically a hard thing to demonstrate on the NW Coast. Some have argued for it for woodworking, others for nephrite working. It’s a hard thing to show — pottery, metalwork — easier. Woodworking, much harder. Maybe these beads are the way forward. Convincing demonstration of craft specialization at 3800 BP would be a huge contribution to NW Coast archaeology. Regarding Dentalia, it’s a great parallel point. We know these were traded in abundance all over. They aren’t trivial to make by any means — a very delicate operation to section them, with costly failures lurking. I am sure you know of Andrew Barton’s MA thesis which reviews a lot of this quite usefully, and one take home message is Dentalia may be more widely available than just W Coast Vancouver Island. I was lucky enough to listen to Terry Clark’s presentation on the beads at the SAAs in Memphis. I personally worked with two KFN members to analyse the beads from DhRp-52 back in 2009. Overall, 100,000 stone disc beads similar to these were recovered from site deposits, all from the component that overlaps with the Charles Culture and Early Locarno Beach phase. I decided to formulate a rigorous morphometric analysis of the beads and we chose to analyse a representative sample of 4,000 beads from different spatial components within late component of the site (non were from the middle or early components). What we found is that beads from one portion of the site were significantly satistically different in size to another area of the site. At the time, I couldn’t believe the results. Also, the beads were more likely to be square beads (the smaller beads) in one area, and the other area was more likely to have circular beads (the larger beads) in the other area. After hearing Terry’s presentation where they found differences in bead size between the two burials, I wonder if there is something complex going on with the beads at DhRp-52 (aside from the obvious fact that there are so many to begin with). My colleague and I are hoping to complete a poster presentation on these findings this year at the SAAs and then hopefully work it into a paper. I am hoping that the report will come out soon, but alas, I have no control over that situation. Anywho, I love the discusssion and would love to hear more! Also, my thesis is available for viewing on my website. Although it doesnt deal with the wapato patch or specifically with the beads, there is some interesting data concerning large rectangular houses that date to about 4,200 years ago. I am hoping to get a version of it published soon in an upcoming edited volume. I’ll keep everyone posted…. The various ideas about how beads were drilled and whether or not there were a few specialized “bead centers” where beads were manufactured but which haven’t yet been found by archaeologists reminds me of other discussions of supposedly difficult technologies that we (euro-american, 21st century archaeologists) don’t understand but which, once figured out, are pretty simple. So I asked a couple of archaeologists here in Washington who have a lot of experience replicating traditional technologies including stone and shell beads, and the answer I got was that the beads are drilled with “a very small point on a bit used with a pump drill.” Such bits would probably be hard to recognize in a lithic assemblage, especially if worn or broken, but that makes more sense to me than either special manufacturing centers or unknown organic bits. If I can get some pictures of such stone bits, I’ll send them to Quentin to post. Thanks Quentin for posting this story– it’s a fascinating site, and a great discussion! worn and/or broken drills are easy to recognize in lithic assemblages if you look at all objects under magnification and know what you are looking for. I spotted about 30 or so of them in a large (n~10,000) Basketmaker II assemblage i recently analyzed. These can be very informal, minimally retouched artifacts. The use-wear formed by drilling medium and hard materials is amongst the easiest of all use-wear traces to recognize – one just needs to look. I could be wrong on this – and i would love to hear folks opinions on this – but it seems to me that most folks on the NWC do not look at all or even many lithic objects with some degree of magnification before they are ‘typed’. Comments? Hi Jesse, this has come up before and without really solid answers. I know you’re skeptical about wooden drills, but just thinking of bone drills, whose main function would be to move an abrasive slurry, would the drill use wear be as dramatic as on a drill where the body of the drill would be the main abrasive agent? Maybe not, but at the same time, it might be distinctive in a different way and possibly not recognized as drillage. Personally I am skeptical there are unknown sites with abundant stone drills which remain to be found. So I’d really like to see rigorous efforts to replicate beads using organic drill bits. I’m also a bit skeptical bone drills remain to be found, in abundance anyway. (This is why my mind keeps drifting to wooden drills but that’s a different story). Thanks for your posts. Emily, it is great to get some more information on the DhRp-52 site. (For those from away, aka the Katzie wet site in the Pitt Meadows/Polders on the approaches to the new Golden Ears Bridge which crosses the Fraser just east of Vancouver, which I very briefly posted on here: https://qmackie.wordpress.com/2010/01/18/wapato-camas-tyee/). It’s fascinating that the beads bent a little to a statistical analysis. This is encouraging and hopefully others will drill into some basic quantitative parameters of these – basic archaeology, in other words. Perhaps they’ve been too numerous and dazzling for quantitative analysis. Look forward to seeing your poster sometime. And, as many are, looking forward to the DhRp-52 report though I understand there are significant roadblocks to that coming out anytime soon. Scott, it’d be great to see the pics of the stone bits. Email them to me if youd like me to post them. Re: pump drills — it’s a good idea especially for the idea of pre-drilling larger blanks with multiple holes and then sectioning them out in plan. Here’s a good video of the basic pump drill idea. http://www.youtube.com/watch?v=xkMdns1hpA0 Someone mentioned the spindle whorl as a sort of rotary technology on the NW coast. I don’t know of any examples of pump drills but as largely organic technology they might be expected to be rare anyway. On the other hand, we tend to find/recognize what we are looking for (and vice versa). … we have shown that current conceptions of a uniform and gradual transition from assem- blages dominated by chipped stone to ones dominated by ground stone are inaccurate. rather, between 5000 and 4500 cal B.P. the artifact assemblages of the Gulf of Georgia experience the beginnings of a major transition that see the gradual increase in the variability of artifact assemblage compositions. Also, the first major investment in ground stone technology at 4500 cal B.P. is through an abrupt introduction of beads into the archaeological record only to be followed by a gradual increase in the proportion of ground stone tools related to subsistence resource extrac- tion. The take home message, perhaps not fully appreciated in this discussion, is that beads are the leading indicator of ground stone technology in the Gulf of Georgia — predating it’s widespread use for “functional technologies” by a thousand years or more — and that there is a major, and rapid technological kink in Gulf culture history around 4800 cal BP (appearance of ground stone/bone/shell). This is just plain interesting in how we think in received ways about the genesis of technological change. Necessity may not, strictly speaking, be the mother of invention — beads before knives — and there may therefore be implications for the driving forces behind the adoption/invention and implementation of ground stone projectile points, and, especially, adzes/chisels and knives — the latter of which have had some ink spilled about how they came about. On the other hand, it, uh, wouldn’t surprise me greatly if we saw, say, some very early, very nice, ground stone adzes and chisels come out of Haida Gwaii, some of which might even predate Chris Ames et al’s beads. And, lumping in ground stone/shell beads with other ground stone might be working too much towards definitions. I mean, don’t they have ground beads in the U.P. well before the neolithic? Is this a deep observation or a curiosity? But in any case, it can only be right to temporarily decouple the (a) appearance of the technology of ground stone/shell and (b) the hyperabundance of its expression. These can be inspected separately then brought back together with a gain in knowledge. reference: 8,000 Years of Technological Change in the Gulf of Georgia: Is There a Major Transition at 4850 cal B.P.? Thank you for emailing information about this impressive discovery. It is always good to learn something new from the past. We enjoy your emailed updates.